You are here: Home / Money / Business / Adam M Smith on What A Grand Jury is All About. Adam M Smith on What A Grand Jury is All About. (ThyBlackMan.com) Last June I had a very in-depth conversation with the great legal mind Adam M Smith, a man who certainly knows his way around a courtroom. During our conversation one of the key things which I wanted him to explain to me was how a Grand Jury worked. Grand Juries are not something which we have back in the UK so I was very keen to learn more about what it is, what the difference is between a Grand Jury and a Trail Jury, as well as finding out a little more about the men/women who attend hearings at the Grand Jury and why, here is what I found out. To give a brief explanation as to what the Grand Jury is, it is a key role in the criminal process which doesn’t seek to find guilt or innocence of a particular party, but rather to work out whether or not criminal charges should be brought about. 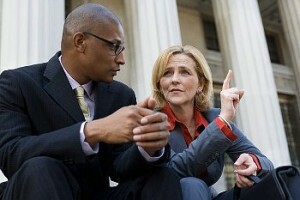 A Grand jury is usually used for serious felonies and can take quite some time to reach a decision. Isn’t That Just Like a Preliminary Hearing? Where a Grand Jury differs from a preliminary hearing is first of all in its usage, with over half of the US states and districts opting for preliminary hearings over a Grand Jury. Secondly a preliminary hearing is almost always open to the public, and will include both a lawyer and a judge, a Grand Jury on the other hadn’t is not open to the public and a judge rarely sits in on the process. Grand Jury proceedings are generally quite relaxed when compared to a normal court room. As we have mentioned there is no judge during a Grand Jury and the only lawyers that will attend will be those from the prosecution, given that as yet there is no defendant. The prosecutors’s job here is to explain to the jury what the law is and which aspect of it they will be using for the proposed trial. During the proceedings evidence, testimonies and exhibits can be heard, but they must be presented in adherence with the strict rules of the court. Another difference between these proceedings and that of a normal court is that these proceedings are kept in strict confidence which allows witnesses to speak without fear, as well as protecting the defendant should the court decide not to indict. To reach a decision on whether or not to proceed with prosecution the court needs to rule in favor by a majority, rather than a landslide. Even if the Grand Jury decides against indictment, the prosecutor can push for trial if they feel as though they have a strong enough argument. The fastest way that the trial will begin will be if the Grand Jury vote for indictment, otherwise it may take longer to get through the process for the prosecutor.